Liveright Publishing Corporation, 9781631490880, 304pp. Now, in this groundbreaking anthology, fourteen exonerated inmates narrate their stories to a roster of high-profile mystery and thriller writers--including Lee Child, Sara Paretsky, Laurie R. King, Jan Burke and S. J. Rozan--while another exoneree's case is explored in a previously unpublished essay by legendary playwright Arthur Miller. An astonishing and unique collaboration, these testimonies bear witness to the incredible stories of innocent men and women who were convicted of serious crimes and cast into the maw of a vast and deeply flawed American criminal justice system before eventually, and miraculously, being exonerated. 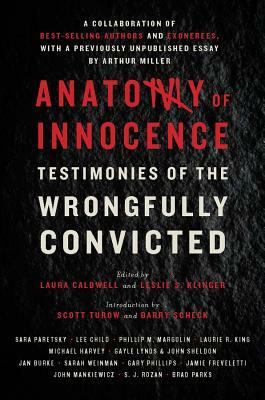 Introduced by best-selling authors Scott Turow and Barry Scheck, these master storytellers capture the tragedy of wrongful convictions as never before and challenge readers to confront the limitations and harsh realities of the American criminal justice system. Lee Child tells of Kirk Bloodsworth, who obsessively read about the burgeoning field of DNA testing, cautiously hoping that it held the key to his acquittal--until he eventually became the first person to be exonerated from death row based on DNA evidence. Judge John Sheldon and author Gayle Lynds team up to share Audrey Edmunds's experience raising her children long distance from her prison cell. And exoneree Gloria Killian recounts to S. J. Rozan her journey from that fateful "knock on the door" and the initial shock of accusation to the scars she carries today.